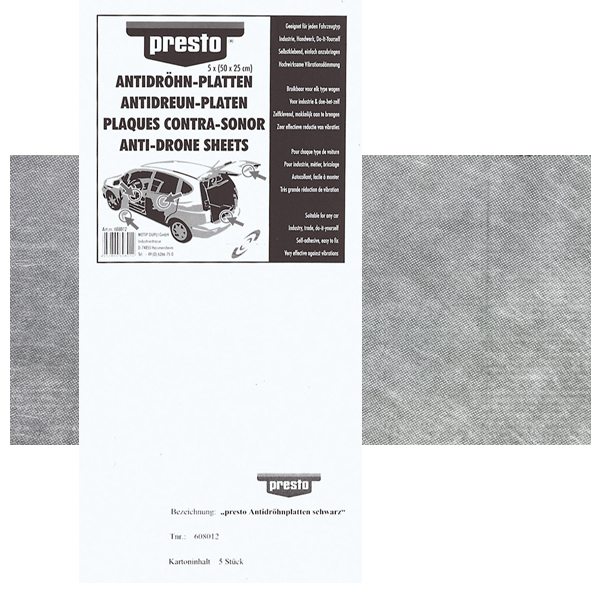 presto Anti-Drone Sheet is a self-adhesive bitumen damping foil based on high-quality polymere-modified bitumen and special fillers. Due to good flexibility during room temperature, the foil can easily adapt itself even to curvature. the foil is self-adhesive with a solvent-free glue. The sticky side is protected by covering material. Variant 2: the upper side of the foil has a fleece lamination (alu-silver) with stabilising effect. Temperature resistance: heat-resistant during 2 hours up to 120°C. Risk of breakage during frost! The surface where you want to apply the sheet has to be clean, fat-free and dry. To clean the surface you can use either acetone, ethanol or methanol. 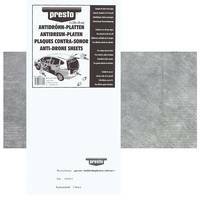 In some cases there may occur problems with adhesion, therefore we recomment to make tests before. Draw the covering foil off. Press the bitumen sheet with the adhesive side to the surface. For best adhesion, the both materials you want to bond should have a temperature of +20°C to +25°C. If you firmly press with a roll, you'll avoid air bubbles. This improves the adhesion. Vertical resp. upside-down bedding is earliest allowed 24 hours after application. Das nächste Spiel schauen wir auf dem selbstgebauten EM-Gartensofa! Mit DUPLI-COLOR platinum und Textilspray geht es in die nächste Runde.